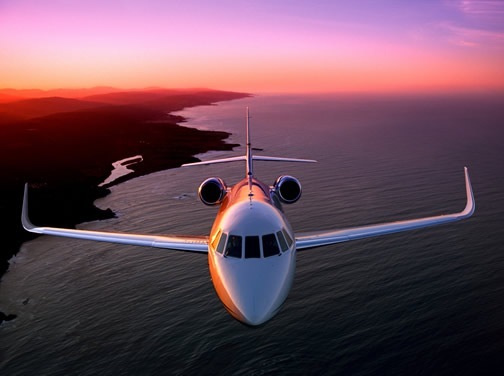 I had the good fortune recently to be invited to ferry a Dassault Falcon 2000LX back to the U.S. – Teterboro in fact – from the factory in Bordeaux France. It was my first Atlantic crossing and certainly gave me new respect for the work it takes to make sure the aircraft really is where it should be over the water. I’m editing some great video of the trip that we’ll have up here pretty soon. My thanks to a bunch of Dassault people who made the trip possible, like Ralph Acceti and Andrew Ponzoni here in the states, and Vadim Feldzer and Philippe Delemue in France. Philippe is Dassault’s chief pilot in France and in charge of all the other pilots who are often forced to share the cockpit with know-it-all journalists like me. This time around though, Philippe sat right seat for most of the trip across the Atlantic. The trip to the Bordeaux factory came right at the tail end of my flight in the Airbus A380 at Toulouse. In order to make it all work, Philippe picked me up in Toulouse and gave me a ride back to Bordeaux to make the connection. He came over in a V-tail Bonanza very much like the one I flew 30 years ago when I started working on my commercial certificate. 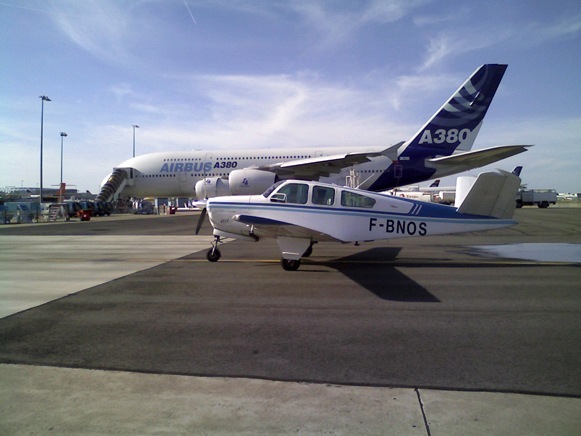 I thought that Bonanza was the coolest thing I ever flew than and even coller now sitting under the A380’s wingtip. 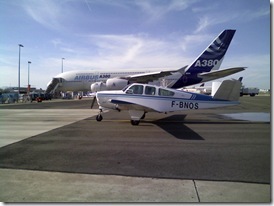 Philippe took a shot of the Dassault Bonanza sitting at Toulouse that just made me smile. I thought you’d all like it. Funniest part was seeing all the Airbus people at the factory falling over themselves to see the V-35 sitting under the A380. Thanks Philippe and everyone else. Remember When ALL the Pilots Were Men? This entry was posted on Wednesday, June 10th, 2009 at 10:11 pm	and is filed under The Buzz. You can follow any responses to this entry through the RSS 2.0 feed. Both comments and pings are currently closed. I look forward to seeing the video. Sounds like you had a great trip.